About a third of insects follow Bermann's Rule, according to Matan Shelomi's research. Bergmann's Rule, introduced by 19th century German biologist Carl Bergmann in 1847, proclaimed that cold-climate animals tend to be larger and stouter than animals living in hot or dry climates. That is, animals living in higher latitudes, such as near the North or South Pole, tend to have a larger body mass than those living near the equator. Bergmann theorized that cold-climate animals need a higher surface-to-volume ratio to stay warm, while those living in hot and dry climates need a lower body surface area to accelerate heat loss and cool the body. "Most warm blooded vertebrates like mammals and birds follow Bergmann's Rule consistently," Shelomi said. "Whether the rule works or even applies to cold-blooded animals like insects is a matter of heated debate." Shelomi wondered if insects are more likely to (1) follow Bergmann's Rule, (2) oppose the rule, or (3) show no ecogeographical pattern at all. So he reviewed nearly 140 published research papers disclosing more than 780 different patterns. "So many factors affect insect size," Shelomi said, "and there is so much variation in the types of insects and the areas where they live, that it's no surprise they don't all respond to changes in macroclimate in the same way." "If you measured a leg instead of a wing, or males instead of females, or covered continents instead of states, or looked at multiple species together instead of just one, your results would be different." He illustrated his journal article with a photo he took of Taiwanese Danaid butterflies (Danaus genutia, the Common Tiger butterfly, and Euploea tulliolus,the Purple Crow butterfly). The caption: "A butterfly's wing size may not correlate predictably with either altitude or latitude." Shelomi cited 207 references, including "Size Distributions of Butterfly Species and the Effect of Latitude on Species Sizes" by N. D. Barlow published in 1994 in Oikos. "Bergmann himself wrote the rule for homeothermic vertebrates (mammals and birds) and might have suggested the mechanism of thermoregulation; the smaller surface area-to-volume ratio of larger animals helps reduce heat loss in cold environments, and vice versa," Shelomi wrote. Shelomi's paper includes guidelines for future researchers to better design studies of insect and other animal size, to minimize error by accounting for natural variation. "Some examples include examining one species at a time," Shelomi said, noting that interspecific studies (where multiple species were studied together) tended to be inconclusive or suggest no rules were operating, when in reality each individual species was following or countering Bergmann's Rule in its own way. Closely related species could act very differently, Shelomi pointed out. "Likewise, studies that were too geographically broad, such as over multiple continents—or too small, such as a single city, tended to miss the real patterns behind the insect sizes. "Whether Bergmann's Rule applies to a particular taxon or clade is idiosyncratic to that group and its habitat and highly dependent on the study's design," Shelomi said. The UC Davis doctoral student, a graduate of Harvard with a bachelor's degree in organismic and evolutionary biology, studies with major professor Lynn Kimsey, director of the Bohart Museum of Entomology and professor of entomology at UC Davis. 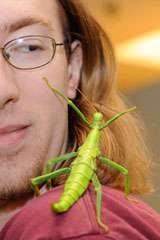 For his dissertation, he is researching the digestive system of Phasmatodea, an order of insects that includes walking sticks. However, his research paper was related to his dissertation. He wrote the paper while enrolled in Art Shapiro's evolution and ecology class on biogeography. "Professor Shapiro mentioned in class that a good final paper could be publishable, which I took as a challenge," Shelomi said. "The result was I spent far more time reading articles and analyzing and reanalyzing the data than I expected. Fifty articles became 300, and soon a class essay became the biggest systematic review of insect morphometrics publications ever made, as far as I know." Shelomi described the response from the scientific community as "positive." "Almost immediately I began getting requests for reprints. As the paper deals with insects around the world, so I began getting emails from around the planet: Japan, Switzerland, Israel, etc. Naturally I got emails from some of the many authors I cited as well, some of whom shared my concerns that assemblage papers—those that try to draw conclusions from multiple species instead of just one—are not providing useful data. And, by the way, he received an "A" on the paper from Shapiro. "Bergmann theorized that cold-climate animals need a higher surface-to-volume ratio to stay warm, while those living in hot and dry climates need a lower body surface area to accelerate heat loss and cool the body." That seems exactly backwards. A *larger* surface per unit volume will lead to faster heat exchange with the environment. That is the main principle for heat-exchanger design. Then there's Bergmann's lesser known rule that younger siblings are usually bigger and dumber. Younger siblings born in a cold climate, you do the math. I perceive somehow symptomatic, when "lite" account downvotes all above quite correct and matter of fact posts. What kind of mental case this individual is about? He spends whole his free time with sitting at PO, checking new posts and with nonsensical abusing of the voting functionality of this forum. It just illustrates the social rule of vandalism: at the moment when some function becomes freely accessible without control, some idiot will always emerge from the crowd for abusing it.